Last week’s draw with Warwickshire confirmed Hove would host division-two cricket again next season and the head coach knows many fans will want and expect promotion next time around. The county are already weighing up what they need to do with the squad to spark an even stronger promotion bid in 2019 but the Australian is positive about strides made by his players this season. 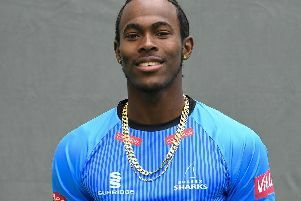 Gillespie, who arrived at Hove only in March, spoke to us at length after the draw that confirmed the visitors’ promotion and ended Sussex’s hopes. He said he definitely felt it had been a season of progress and commented: “A number of players have been afforded an opportunity and have put some decent performances on the board so from an individual point of view it’s good to see a couple making runs and taking wickets. Gillespie praised the displays by young players like Phil Salt, Michael Burgess, Tom Haines and Harry Finch, among others. He added: “I feel as an outsider who’s come into the club that we’ve made some strides. Sussex’s one-day side missed out on the knockout stages of the Royal London One Day Cup but got to Vitality Blast Finals Day, losing in the penultimate over of the final against Worcestershire. “In the 50-over competition, I thought we could have done a little better, to be perfectly honest. “We showed glimpses of what we could do but we either batted really well or bowled really well. We didn’t put in too many complete performances. “In the T20 Blast I am very proud of the players and the way they went about it. Ollie Robinson and Laurie Evans were named the county’s top four-day and one-day players of the campaign and Gillespie said the awards were fully deserved. He went on: “If you look at our batting I think we’ve made some really good progress. “But we need to be a bit more consistent. There’ve been times when we’ve lost wickets in clumps through the summer so we have minimise those situations. I’ve been really pleased with the bowling. We’ve had essentially the same four seamers for the majority of the summer, plus Danny (Briggs), who has been absolutely outstanding. I think we’re still a little way away from being ruthless.